Cannabis with a street value of up to quarter of a million pounds has been seized from an address in Birmingham. Police made the discovery in Burbury Street in the Lozells area of the city on Friday afternoon. More than 100 matured cannabis plants were removed from the property, described by police as a "professional cannabis factory". In addition, a "substantial" amount of money and specialised equipment worth thousands was also seized. 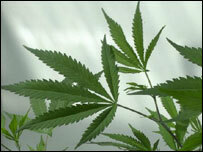 Police say over the plants could have yielded a second crop, doubling their street value to £500,000. A woman in her 50s is helping police with their inquiries.